The UQ Pro Bono Centre Report on their Pro Bono Values Project, titled What does pro bono publico mean to lawyers?, found that a sense of moral obligation and professional responsibility were nominated by the most lawyers (28 per cent each) as reasons why they do pro bono work, followed closely the need to improve access to justice (21 per cent). Many participants expressed frustration at the lack government funding for the provision of legal services and the idea that pro bono work will fill this gap. Fifty-five lawyers working in small, medium and large law firms, community legal centres, in-house counsel, Legal Aid and the private bar were interviewed by telephone for the Project, which aimed to gain a greater insight into lawyers’ personal motivations and values that contributed to their engagement with pro bono work, and their perceptions of pro bono trends and debates. A full copy of the Study can be found here. 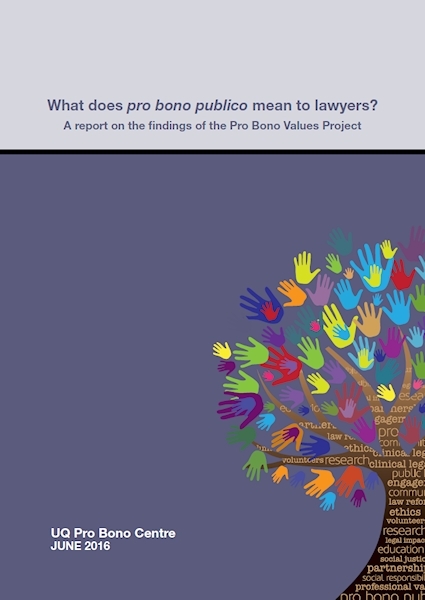 The Report also addresses other areas including views about international pro bono work, gender sentiments about lawyering and the effect of differing institutional settings on engagement in pro bono work. Monica Taylor, Director of the UQ Pro Bono Centre, and Clare Cappa, Senior Lecturer in the TC Beirne School of Law at UQ, also recently wrote in the most recent issue – 41(2) – of the Alternative Law Journal about the Project. Charitable acts do not involve the provision of legal advice. It might be volunteering, donating something practical or donating money. But the donation of money is not pro bono even if you are donating it to a CLC or some other legal service. We have to act without fear or favour. Without favour includes that, “you are paying me therefore I will do a better job”. We have a duty to the court that is not diluted by the fact that they are not paying. For some, if they were being honest, would say that is the case. But for me personally if I take a matter on, regardless of if I have been paid or not, they get the same treatment. This is probably one of my bugbears….recent cuts to funding, particularly… by state and federal governments and the fact that there is an expectation that [legal services] will be picked up by the pro bono sector. Part of me goes, well if we all just stopped helping, then the government might have to do something. But I also can see the significant downfalls in that…. the government kind of gets away with cutting very required area of legal need.